National Weather Service meteorologist David Nadler describes changes in technology that allow forecasters to know more precisely where a hurricane might affect an area. The effects of the first named storm of 2018 claimed lives before the official start of hurricane season, but leaders with Georgia Power, the National Weather Service and the Georgia Emergency Management Agency have been investing in technology, planning and preparing. Despite advances in technology, the best resource for damage assessment after a storm is "boots on the ground," Georgia Power's David Maske said at a hurricane summit last week. Officials with the National Weather Service, Georgia Emergency Management Agency and Georgia Power are preparing for the 2018 hurricane season that runs June 1 through Nov. 30. "We want every storm to have less impact than the storm prior to it," Maske said. "So, what are our challenges? The same challenges everybody else has: hurricanes, ice, tornadoes and lightning, flooding, other physical damage." Someone has to go out and evaluate the equipment for utility compaines, Maske said, much the same way reporters bring storm covereage to their audiences. Subtropical Storm Alberto made landfall May 28 in Florida and continued with heavy rain and high winds across the Southeast. A storm is named at 39 mph winds, and becomes a hurricane at 74 mph. Photojournalist Aaron Smeltzer and Anchor Mike McCormick of WYFF News 4 in South Carolina were killed in North Carolina when a tree fell on their SUV while covering the storm. Part of Maske's job involves positioning the two mobile command centers, and making staging decisions for contractors who come from neighboring states all the way to Canada. Taking care of the utility workers with food, a place to sleep, laundry and shower facilities on sites is paramount to any planning Maske does. "So what do we do in a storm restoration? We watch the weather. We look at all the reports. We take our best guess on where the impact the greatest impact is going to be," Maske said. "As you look at where that impact is going to be, you start saying, 'What resources do they have? Do they have enough resources in each area?' If they don't, then you start looking moving some resources down there." Two self-contained, internet-ready, mobile command centers are available for positioning in Georgia. 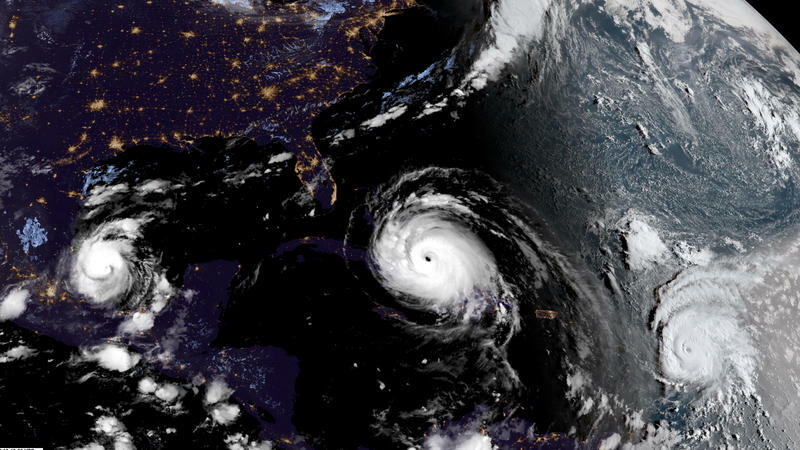 One of the ways technology has helped preparations is in the way forecasters predict where hurricanes could hit, National Weather Service meteorologist David Nadler said. The "cone" is a tool forecasters use to predict where the center of a hurricane will travel. Over the last decade the cone has gotten smaller, allowing more precision in forecasting, Nadler said. But he cautioned that the storm's path is never limited to its center. "Sometimes, these these outer rain bands from tropical systems could be 100 miles away from or more from the center of the storm," Nadler said. When a storm stalls or moves slowly, the chances of flooding increase, which coastal Georgia saw with Hurricane Matthew in 2016. Tornadoes are most common from high winds spinning off the right-front quadrant of a storm, Nadler said. Hurricane Irma skirted Georgia's border, but several metro Atlanta counties experienced damage from downed trees and heavy rain. This year, the National Oceanic and Atmospheric Administration forecasts 10 to 16 named storms, five to nine of which could become hurricanes. Up to four major hurricanes (which hit winds of 111 mph or higher) are possible as well. Where will it go? How strong will it be? When will it hit? Those are the answers everyone wants — not the least of which are the hurricane forecasters themselves. To get those answers, hundreds of millions of data points — everything from wind speeds to sea temperatures — pouring in from satellites, aircraft, balloons, buoys and ground stations are fed into the world's fastest computers and programmed with a variety of models at different resolutions, some looking at the big picture, others zooming in much closer. Friday marks the beginning of the 2018 hurricane season, which stretches from June 1 to Nov. 30, according to the National Oceanic and Atmospheric Administration. This year, NOAA’s Climate Prediction Center forecasts a 40 percent chance of a normal season, and a 35 percent chance of an above-normal season. June 1 is the official start of hurricane season. GPB Savannah's Cindy Hill tells us what forecasters are predicting this year.